Take I-95 to Exit 44, Palmetto Park Rd. Go east. 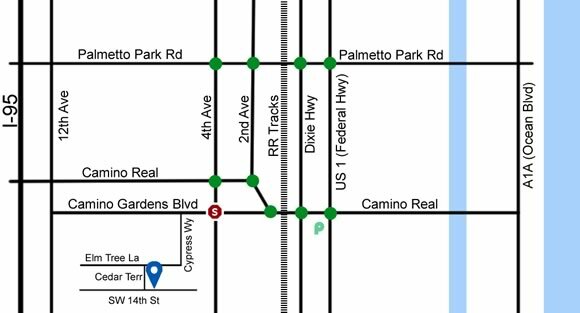 Follow Palmetto to 4th Ave and turn south. 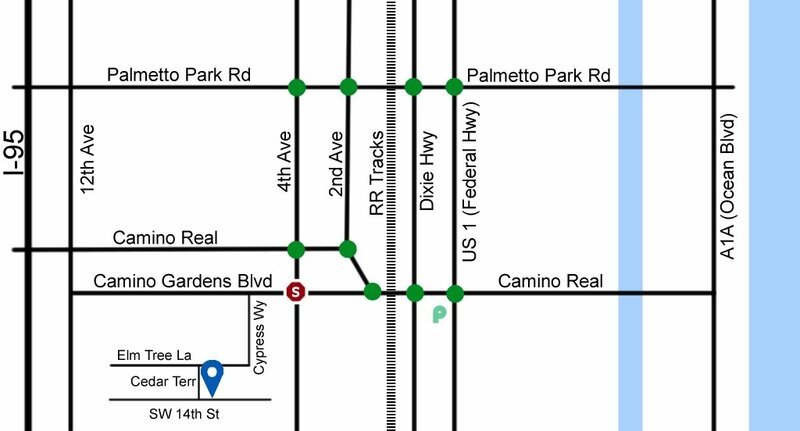 Continue south and cross over Camino Real at the next light. At the first stop sign, turn right onto Camino Gardens Blvd. Immediately after crossing the bridge, turn left onto Cypress Way. Stay on Cypress Way even though it makes a sharp turn and changes to Elm Tree La. At the small roundabout, turn left onto Cedar Terr. First left onto SW 14th St.
First driveway on the left, at the corner of Cedar Terr and SW 14th St.